Hi there people. This will just take a few minutes. I know this is sort of late considering every other gamepress/blogs have already blabbered about this thing, but hey I'm always late aren't I. So without further ado, the elephant in the room, Heavenly Aegis. What the heck is that. I mean really. Heavenly Aegis is a Havencraft Legendary card released in the Tempest expansion and if anything, it is MONSTROUS. Its cost does not affect its abilities at all. For one, this card cannot be damaged. Like it literally will stay on the field indefinitely. 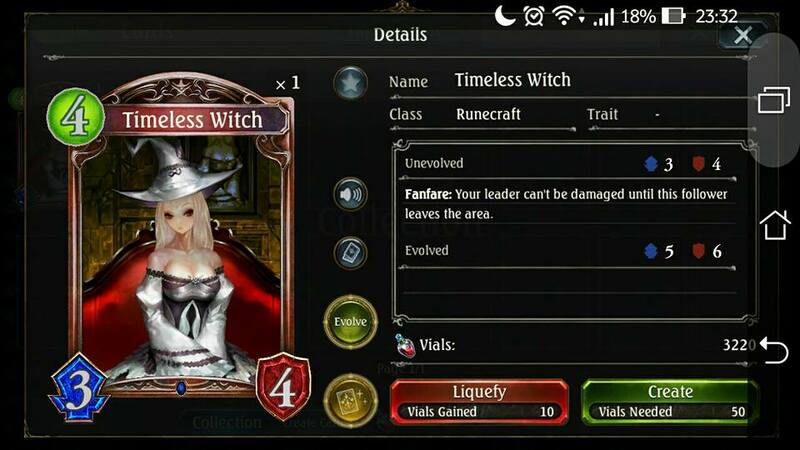 Its second, crazier ability is that it can't be affected by any other card's abilities except the ones that change it's attack or defense. This is what makes Heavenly Aegis so strong. You can't beat it to death, you can't bane it, you can't banish it, heck you can't even use a "target random enemy" effect or an area effect to remove it from the field. Any and all effects will be nullified if it hits him. Me and my friends unleashed all sorts of destruction onto this piece of armor and it just won't budge. Not even the Legendary Bahamut. Not even then. "Does Test of Strength affect Heavenly Aegis?" The answer is no. Heavenly Aegis is not affected by Test of Strength (a.k.a. Test). 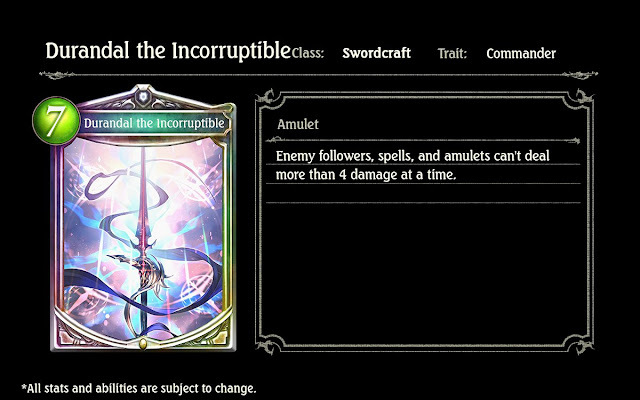 The main problem here is that Test's ability acts upon a follower's ability to attack and not actually giving leaders damage immunity unlike Timeless Witch and Durandal The Incorruptible thus giving Aegis free pass to clonking you in the face. A cheap sort of, kind of, deterrent to Aegis I guess. Now now. There are ways around this thing. I mean everything have their weaknesses. 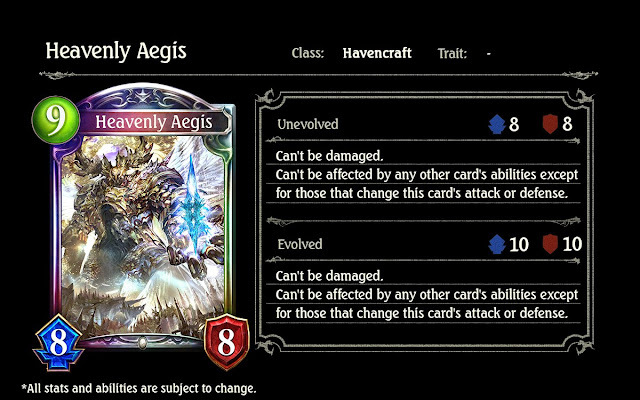 Aegis has a whopping cost of 9 (though I really think they should make it 10) so it'll be a while before it comes into play, unleashing hell unto you. So make it fast. Do it before then. Though... This will be a problem for control decks. 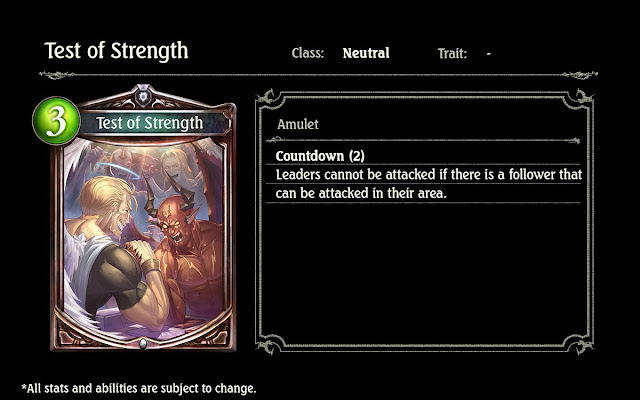 Aegis is specifically a counter for control decks anyway. I can't find a decent colored art for this so... Ahem. A real counter to Aegis would be Kaguya. 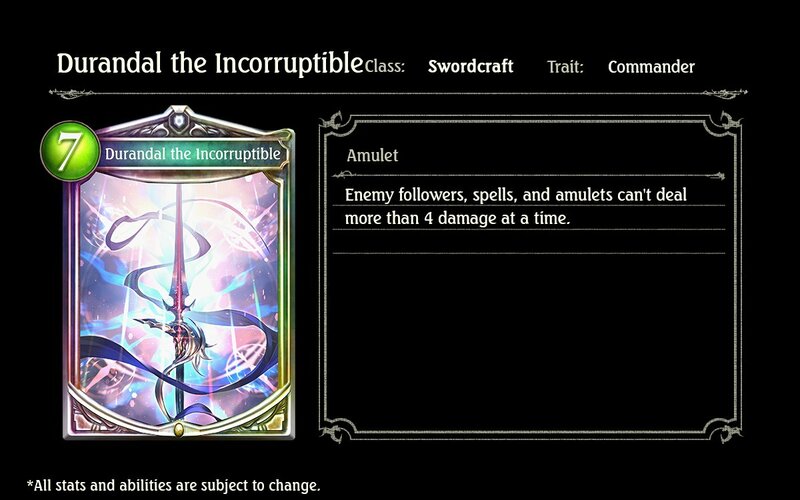 Before Aegis, I have never even thought of using this card though. 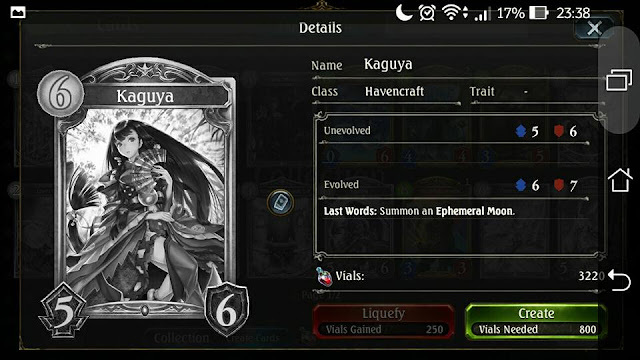 The Ephemeral Moon amulet that Kaguya summons when she dies has the effect of reducing the attack of a strongest enemy follower on the field to 1. This effect changes Aegis's attack to 1, rendering it sort of useless. I mean, the guy is still there, but he deals 1 damage to you anyway so you can ignore him now. That's not much to go on but hey, its not TOTALLY impossible. Its just a tad hard. Okay its very hard. Seriously speaking, I wouldn't know what to do if my opponent puts that thing on the field. Though you might want to see Rkidzzz stick it up to Aegis users using his awesome Dragoncraft deck when he goes live on Twitch. If you're lucky that is.